No Joke (installation view) (2015). Image courtesy of Tanya Leighton, Berlin. What is the difference between the drunk bus and a joke? No Joke, a recent exhibition curated by Sanya Kantarovsky at Tanya Leighton, included works spanning the last 75 years. Seminal works by the kings of artistic comedy are central to both the original gallery with its iconic gray stairs, as well as the newly-minted addition directly across the avenue. Michael Smith’s How to Curate Your Own Group Exhibition (Do It) (1996), is a deadpan step-by-step instructional video; a now all too familiar Saturday Night Live-like sketch which trains the viewer on the “transferral of curatorial responsibilities into the hands of the artists,” as well as on being “an artist who simply wants to get into more group shows”. A collection of rantings and ravings could be found in Ad Reinhardt’s Selected Comics (1946-61), which witfully call into crisis art world tropes. 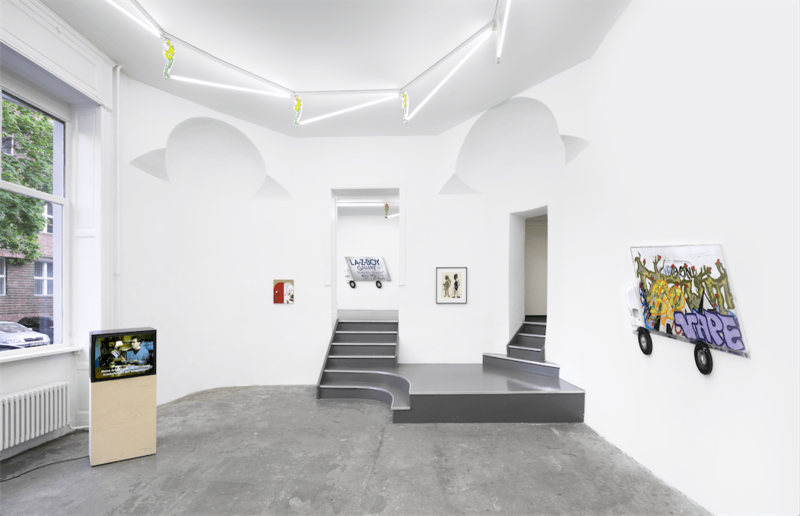 The works were positioned squarely in the entrance of the second gallery space, reading as a central subtext of the exhibition. Herluf Bidstrup’s energetic cartoons and Saul Steinberg’s photographs cleverly utilize visual puns as an accessible platform for illustrating the systemic ethos of the artists’ contemporary moment. 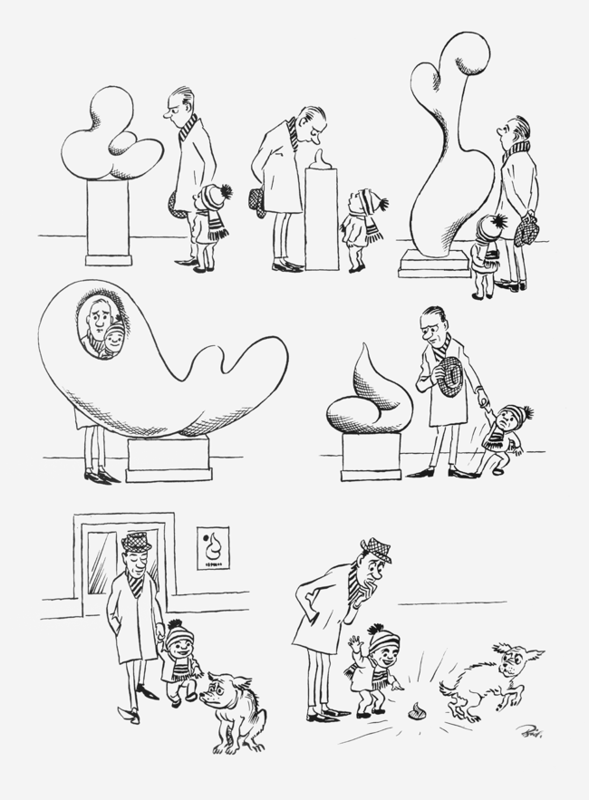 Herluf Bidstrup, Masterpiece (1967). Silkscreen on wall, 47 1/4 x 33 1/2 inches. Image courtesy of the artist and Tanya Leighton, Berlin. Soaking with complex, juicy, and satirical irony, these works required some healthy time to digest; with the artists witfully splashing and jabbing in order to keep their heads afloat in an ocean of sink or swim reality. While these seminal works in the exhibition display a persuasive poignancy through narrative gumption (that could turn an apple into thinking it’s a pear), they also give way to their surrounding generational offspring. The work by contemporaries that shared the stage with these canonized compatriots seemed to stem from an incestuous birth of Uncle Satire and Auntie Irony: a coupling that results in constrained formal paintings that are too inbred to make fun of anything but themselves. Allison Katz, Janus (2011). Acrylic on linen, 17 x 13 3/4 inches. Image courtesy of the artist and Tanya Leighton, Berlin. Luckily, a few of our youngsters spanned the gap between seasoned complexity and tender-footed vacancy. Sean Landers’ Dark Trees (Hello!) (2014)—a trompe l’oeil canvas scribbled with melodramatic, desperate, and sometimes nonsensical tree carvings—contrasts between humor’s power to postpone the thought of our inescapable death and our attempts to leave a lasting impression (both physically and culturally). 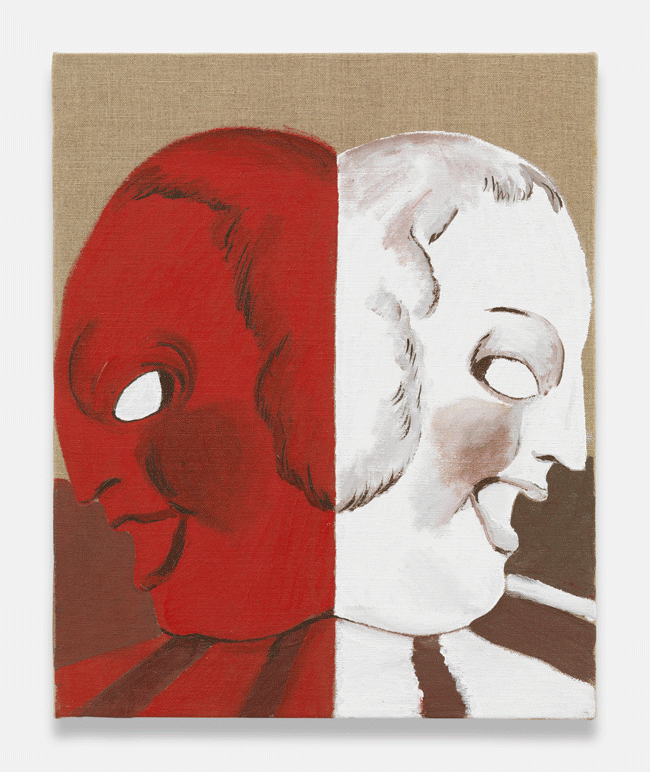 Allison Katz’ Janus (2011), paints two tragedy/ comedy masks frozen in a mirrored state of neurosis, melding the two traditionally disparate emotions into a stasis of skeptical optimism. No Joke oscillates between subversive discourse and nonsensical nihilism, and Berlin is no stranger to either. From Berlin’s cultivation of German philosophy and literature to its Weimar-Era Dadaism, the existential attitude for the Berliner is a natural one, and is almost required for all outsiders requesting a visa. But this attitude is not known for its nonchalant self-reflexivity. The actors in No Joke performed with a refreshing (and much needed) air of capriciousness, yet the overall emphasis on cool-kid formalism and blase humor ran the risk of missing the punchline when it comes to German ethos. So which is more solipsistic, the one who tells a joke in the wrong context or the one who refuses to get it? Michael Smith, How to Curate Your Own Group Exhibition (Do It) (1996). Sigmund Freud, On Humor (1927). Page 162. Vanessa Place, Art is a Joke (28.2.2013). UC Irvine (lecture). 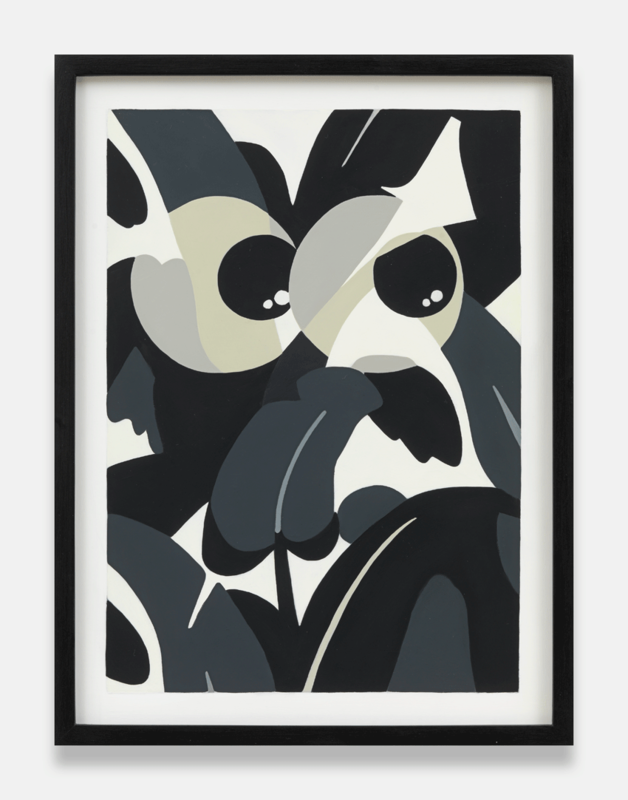 Laeh Glenn, Eyeballs (2015). Oil on panel, wood frame, 16 1/2 x 12 3/4 inches. Image courtesy of the artist and Tanya Leighton, Berlin. No Joke runs from May 2–June 27, 2015 at Tanya Leighton.